In my search for stories about Indian Mariners, I decided that I would focus on the decade between 1830 and 1840 give or take a couple of years. I did, however, allow for some exceptions. This particular exception falls about twenty years later and involves lots of sheer luck (on my part). As I reviewed thousands of customs records, one in particular caught my eye. It was a Surrendered Crew List for the Ship Electra that had been collected by the customs official at the Port of New London on August 4, 1862. Included among the crew were two Mashantucket Pequot whalemen, Amos W. George and Samuel Fagins (sometimes called Sampson or Sanford). They were bound to the Pacific Ocean on a whaling voyage. Since my goal was to begin mapping voyages of traveling Pequots, my assistant Debra Jones (a Mashantucket Pequot Tribal Elder) and I began looking for the logbook of the Electra. Conveniently, it was located at the New London County Historical Society where, at the invitation of Executive Director Edward Baker, we were able to view – and later – digitize it. What we didn’t know until we viewed the logbook though was that it was actually the last voyage of the Electra. 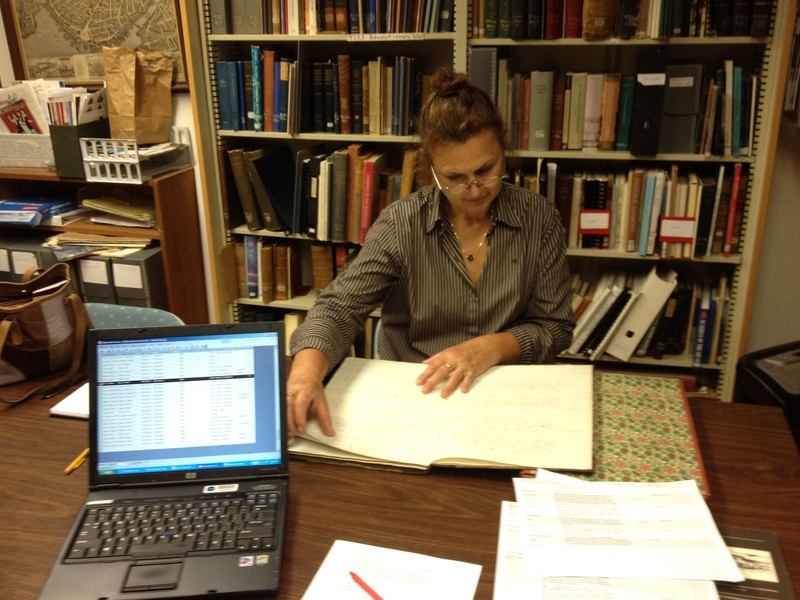 Debra Jones with the logbook of the Ship Electra at the New London County Historical Society. August 12, 2012. One tends to think horrible things about shipwrecks. The curious thing about all of this was that we were holding the logbook in our hands. It survived…and so did the crew of the Electra! But how? Curiously, for the prior six weeks, when the Electra first arrived to the coast of Alaska, she had been within sight and frequently “speaking to” the Bark Nile of New London, also whaling in the area. I thought it would be a long shot to find the log of the Nile, but I searched at New London County Historical Society and Mystic Seaport. No luck. I had been in contact with the staff of the archives at the New Bedford Whaling Museum (NBWM) and to assist my research, they sent their complete and very detailed database of all the logbooks in their collections. I scoured it. Bark Nile? Yes! Even more interesting was that the logbook began on July 12, 1863 – the day after the Electra wrecked. Note: The handwriting for the log of the Nile is identical to that of the Electra. Bark Nile – © Mystic Seaport, #1939.1284; the Nile is known to have logged the longest recorded whaling voyage at 11 years). So the travels of Amos and Sam continued to Hawaii. 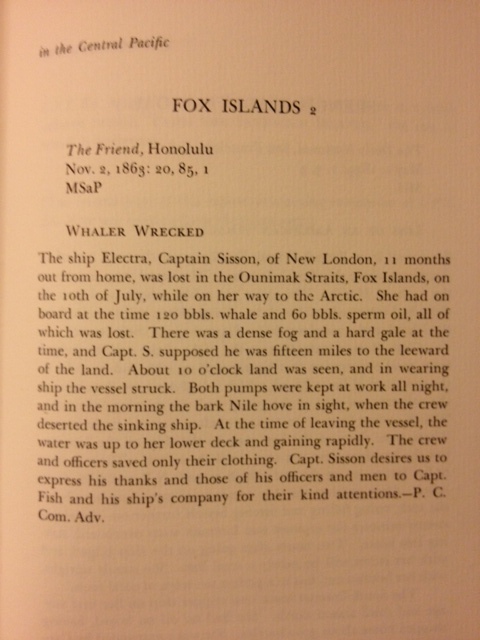 On my recent trip to the Hawaii State Archives, I located both men as “Discharged Foreign Seamen” in the subsequent five years on different whaling vessels. Since the center of gravity of the whalefishery had now shifted from New England to the Pacific ports of San Francisco and the Hawaiian Islands, my suspicion is that the two Pequots remained there for at least five years. They had returned to Mashantucket by 1870. In that year, both were recorded by Federal census officials as living in the same house – one that Sam had grown up in. 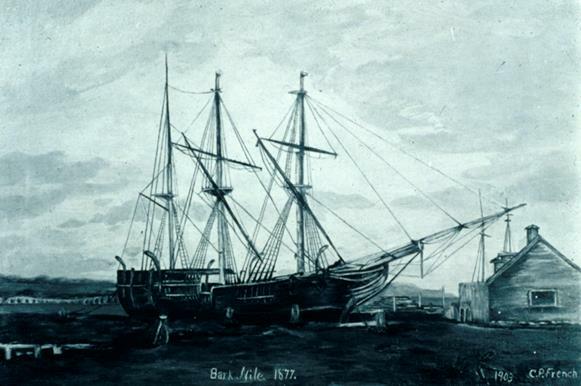 This entry was posted in Uncategorized and tagged Amos W. George, Bark Nile, Hawaii, Hawaii State Archives, Mashantucket Pequot, Mystic Seaport, New London Connecticut, New London County Historical Society, Pequot, Sam Fagins, Ship Electra, whaling. Bookmark the permalink.